Y’all, these potatoes. My family loves them. I make them at least twice a week, at least. And even then, whenever I tell the kids I’m making “those potatoes” they get just as excited as if it had just been declared a major holiday in my house. On the days I don’t tell then in advance, their noses lead them to the kitchen. “Do I smell those potatoes?”. There have actually been evenings when additional people showed up after an excited phone call from my daughter letting them know what was in the oven. The great thing is, they are easy as can be, which is partly why I enjoy making them. The secret is in the type of potato and the seasoning. We just got back from a little trip for our 20th Wedding Anniversary. Our wedding anniversary is in August but we met Feb 14, 1998. Since this is our twentieth year, we decided to do something a little more than ordering pizza and actually take a trip. So we went to the one place we enjoy going to: Disney World. Of course, we went in February instead of August because they simply do not print enough money to pay us to visit Disney World in August. We had a wonderful time, taking it slow and easy. Some mornings we got up early, some mornings we took our time getting out of the room. Some evenings we came back and relaxed over cups of coffee at an outdoor table. We enjoyed our time together. If you haven’t read my post with advice to young married folks, click here to read that now. But shortly before we went on this trip, the night before actually, we found ourselves sitting in our living room with both kids sitting across from us. My husband and I had been sitting in our chairs talking and our son had ambled in and sat down and joined in. A few minutes later our daughter passed through the room and she sat down and joined in, too. Our son, who is headed off to the great big world of college this fall, was asking us for advice on how to ensure his success. Now, when a teenager asks for life advice, you don’t let that opportunity pass you by. We were dolling out information ranging from work ethic to respect of others to making wise choices in the company you keep. And he was listening. And our daughter was listening. It was awesome. Then, in the middle of this thoughtful dialogue among the four of us, I looked over to my husband of twenty years and something else came to mind. Now get ready for something controversial in today’s world but keep in mind that this based on my experience, and advice to my own kids: I said “You know, there is another important thing to think about when it comes to looking at your life as a whole and wanting to be successful.” All eyes turned to me and I took a deep breath. “Getting married. Having the right partner by your side will make all the difference versus going it alone.” My husband immediately nodded in agreement and we quickly issued the disclaimer that we weren’t pushing this as a “do it soon” sort of thing but rather a “put this in your back pocket” sort of thing. This is not popular advice today and I understand why. In a world where the focus is on self, we end up spending most of our lives looking to satisfy self in all things, rather than coming together and bonding over working for the good of the whole, collectively, which benefits all involved. Aside from that, there are an awful lot of bad marriages for an awful lot of reasons, both new and old. With the generations coming of age right now, I don’t see that getting any better, but rather worse. But the fact still remains, that a good marriage, no matter how rare it becomes, is a lifelong advantage for those in it. You have a partner, someone always on your side, someone to figure things out with, someone to lean on, someone who can lean on you. And I want that for my kids. Will they get it? I don’t know. I hope so. But whether or not they do is not in our hands, but it is in our prayers. Already, they have wonderful friends and that is something else we prayed for. And so we hope and pray, as parents, for the best for our kids. And to us, in our lives, that means praying for a good marriage, when the time is right. And wow. I got a chance to tell them that. To share my hopes for their future and why I wanted that for them. And they listened. Now to anyone who is offended by this, that was not my intent and I hope you will soften your heart in order to see where mine is. I want the best for you as well and I fully realize that what is best for you might look different than what is best for me. I also realize we may have different hopes and dreams for our kids and ourselves, but each of us strives for and hopes for what we see as the best. My children, once they are out on their own, might take an entirely different road in life and my role on that journey will be to love them and hope for whatever their new best may be. Whatever that best may be for you and yours, I hope you have it right now, or in the nearest possible future. And I hope that we all have time to sit back, take a deep breath, and appreciate the fullness of our own blessings. 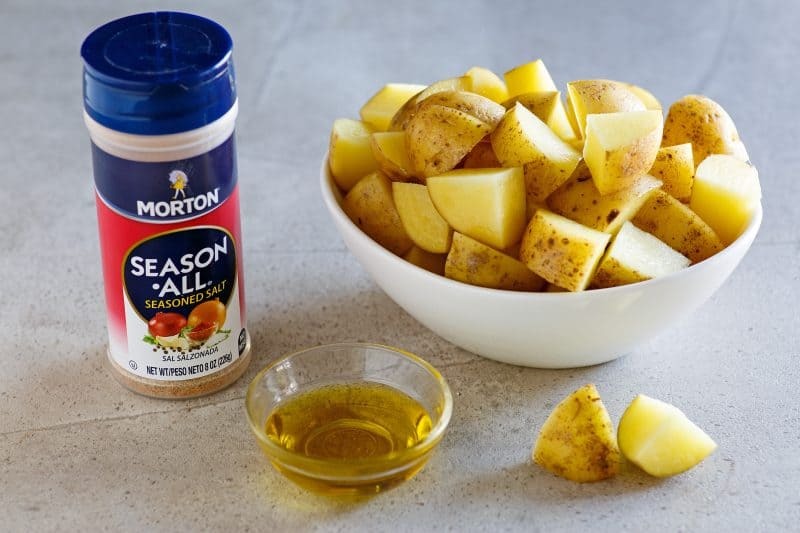 To make these, you’ll need: Yukon Gold Potatoes, Olive Oil, and Seasoned Salt. 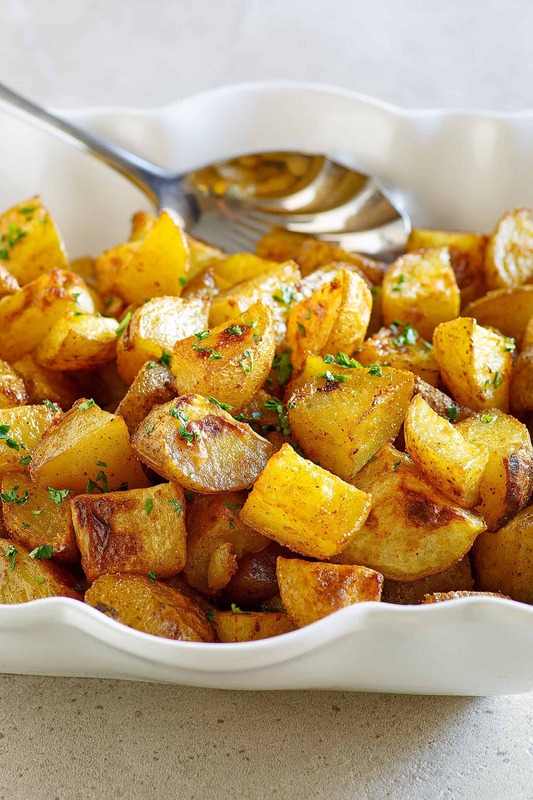 Now you can do this recipe with any type of potato but Yukon gold is the best because they have a natural buttery taste to them and a nice soft yellow flesh that holds up well to roasting. I like Morton’s because many of my grandparents worked for the company that owned that. 🙂 They worked for Morton Thiokol in Huntsville, Alabama way back in the day. I have a lot of memories of Thiokol growing up. They used to have these wonderful family picnics for their employees that were pretty much festivals, and the employees could bring their kids, grandkids, etc. We always went and had the best time! Begin by cutting all of your potatoes into cubes. Place them on a baking sheet or a baking sheet lined with parchment for easier cleanup. You can also line it with foil if you like. 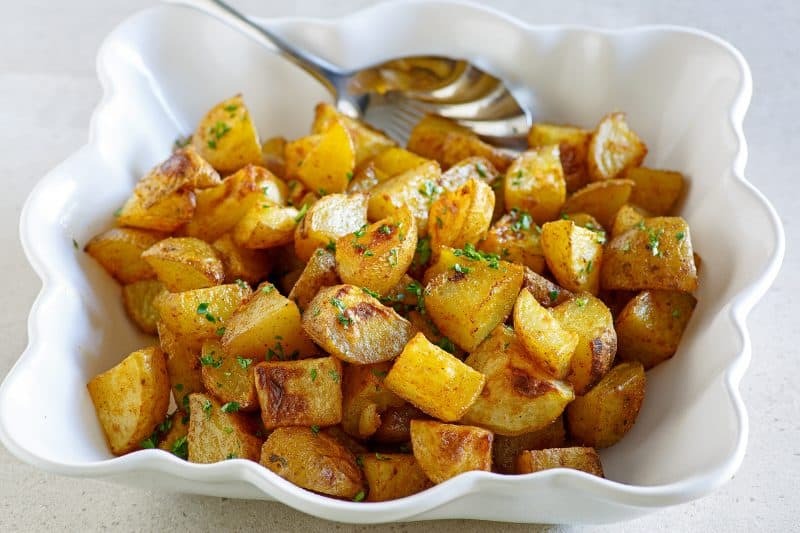 Drizzle olive oil generously over potatoes and use your hands to toss them until well coated. Sprinkle liberally with Seasoned Salt. Bake at 400 for about thirty minutes, stirring halfway through and sprinkling with seasoned salt again. When they are done they will have lightly browned edges and be nice and soft to the bite. 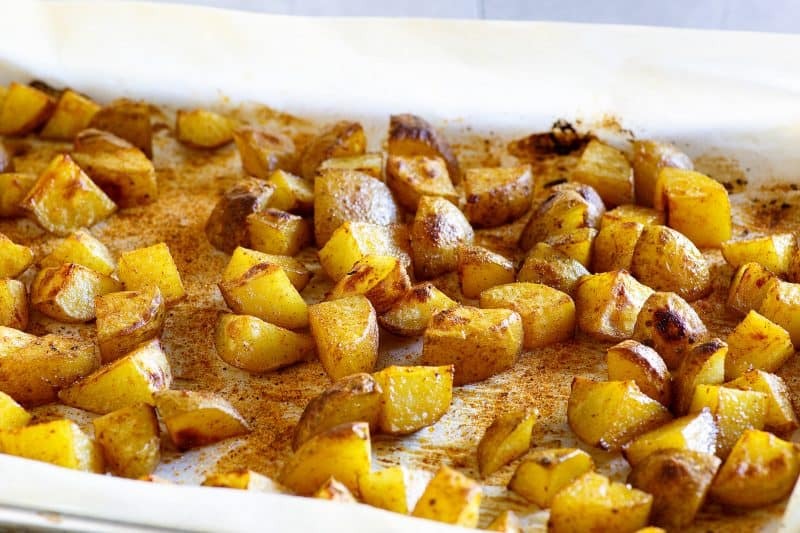 We love these as a side dish to anything under the sun! I hope you get to try them soon. Don’t let the simpleness of the recipe lead you to believe they are anything other than fabulous! So many times, simple recipes really are the best. Wash potatoes. Cut into cubes (skin on). Place on large rimmed baking sheet, Drizzle olive oil generously over. Using your hands, toss the potatoes well to coat. Sprinkle liberally with Season All. Bake at 400 for about 30 minutes, stirring halfway through and sprinkling with season all again, until lightly browned. These look delicious! I loved your post and I don’t see how anyone could be offended. We need more parents giving that advice to their children and living that in their own lives. My husband passed away less than a month ago so cherish each and every moment you have with your spouse and live life to the fullest. I agree and I really hope no one is offended, but rather encouraged. Blessings to you and I’m so sorry for the loss of your beloved husband. We will certainly go forward with your wonderful advice. Thank you. I know how it is to lose a someone . My wife passed almost 13 years ago . I enjoy these posts and try a lot of them . I like to bake my potatoes also . I married for the first time at age 40, and it helped me to appreciate the loyalty and friendship we share with one another. I don’t know how anyone could be offended by your beautiful words. Thank you for being such a sweet soul. So true! 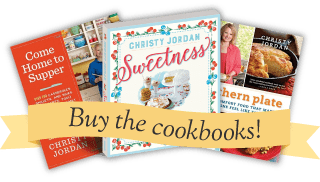 I love this blog, the advice, and the recipes! Keep up the good work, Christy! I absolutely love your complete post here! I truly do and I am waiting for my to be husband, could agree with you stronger. Thank you for your recipe, which sounds very yummy, and your words of encouragement. I’ll join you in prayer! Thank you for being here! I look forward to trying your potatoes just this way, Christy. But I also appreciate your post about marriage. While it isn’t a command from God, I believe that it was His plan for the ideal. Not everyone is lucky enough to find the perfect mate, and there’s no shame in going through life single. But having a life companion to help you through makes a wonderful difference. Thank you, as always for your sweet words of wisdom to your children and us, your friends. Agree completely, thank you so much for taking time to comment and share your encouragement! I have friends and a sister who are in the same place, Michele, and I agree with you. I loved this post on a lifelong marriage. Intend to share it with my grandson; who seems to have a different girlfriend every 2 weeks. This has caused him to have his heart broken many times, as well as the young ladies, at the ripe old age of 20. God’s ways are higher than our ways. Good advice Christy. I totally agree with all you shared with your children. After 20 years of being happily married, you and your husband are also “speaking” to them without saying a word. My parents were married for 72 years and were a great example to my sisters and me. Three of us were married in the same year…1970..(which will be 48 years this year) and are all happy! I hope to share your story with my four teenage grandchildren! WOW, 3 children all married in the same year. Bless your Mama, I can’t even begin to imagine the roller coaster of emotions that year brought and what a wonderful blessing it was to see everyone happy for the years forward! Amen on your advice about marriage. Too many seem to feel that If a marriage doesn’t work, divorce is an option. My husband and I will be married 55 years in July and I was determined from the beginning that divorce would NEVER be an option. Jerry felt the same way and we are still going strong and thank God for each other. 🙂 What a blessing!!! More people need to take a page out of your book and go into a marriage with the outlook that divorce is NOT an option! Hey Christy! As always, I totally agree with you 🙂 Thank you for sharing that! You are wise beyond your years. Do not worry about controversy, you are right on target! Love to you & all your family. Thank you Sandy, love and blessings to you and yours!! Thank you Jane!! I will be in prayerful agreement with you for your daughters marriage to be blessed!! I am so sorry for your loss Thelma, I can’t even begin to imagine the heartbreak so I will just send you my love and hugs! Blessings to you and yours! Good advice. My husb and I were both in our 30’s when we got married, because that’s when we were ready and when we met each other. We’re at our 10 year wedding anniversary this summer and I love him as much as I have ever loved anything in this life. Be alert, be open, have correct expectations and make sure you are READY when the time comes. I’m so happy for you that you got to have that conversation with your kids. It sounds like one of those landmark moments in life that you’ll never forget. Thank you so much for sharing Erin, that is such great advice!! Hey Christy! Love your entire post. My husband and I will be celebrating our 20th anniversary in May this year. We met online in January, met in person on April 4 and were married May 12. He is God’s perfect gift for me because only God could have put us together from 600+ miles away and we still be together 20 years later. Happy early anniversary to you. Making your potatoes tomorrow too. Enjoy the potatoes and congratulations on your upcoming anniversary!! I pray the next 20 years as even more blessed than the first 20!! Yes, having the right person by your side definitely makes it so enjoyable. When we have God in the center of our marriage it makes all the difference in the world. That goes for everything I feel like. Thank you for all your help, advice, & recipes! I agree Maribeth, God does make all the difference in the world!!! Christy, you are SO right about marriage! My husband and I have been together for soon to be 48 years. I thank God daily for the great man he sent me to walk life’s road with. One thing I would like to add: make sure you’re FRIENDS! Good looks and romance are nice but are not necessarily forever. I am lucky to be married to my best friend and that makes life continue to be an adventure! You are so right Cindy, friendship is a very important part of a successful marriage! I pray the next 48 years are just as blessed as the first!! Those potatoes are literally making my mouth water! Christy, I believe you are spot on with your comments on marriage. Unfortunately I was not blessed with a mate. Of course I got used to being single and it’s my comfort zone but I got very sick in fall of 2016 and almost died. After being in a coma for a month, the new me sees things differently. I so desire a husband. The companionship would be so nice. I don’t really know if it is in God’s plan for me to marry but I hope and pray so. Thank you Patti! I will be praying for God’s will in your life. It is my hope that He sees the perfect mate for you and will send him in your direction! As a single woman who has no real desire to be married, I can tell you there is no reason anyone should be offended by your post. As you stated, you want the best for your kids and you hope it includes a happy, healthy marriage and I think that’s beautiful. You also recognize that that may not be what ends up happening, which is also beautiful, you have your hopes for them, but you know you have to roll with whatever their lives become. That’s all a kid can ask for, support from their parents no matter what. Also, you’ve provided them with an amazing example of a happy, healthy marriage which you should be very proud of. 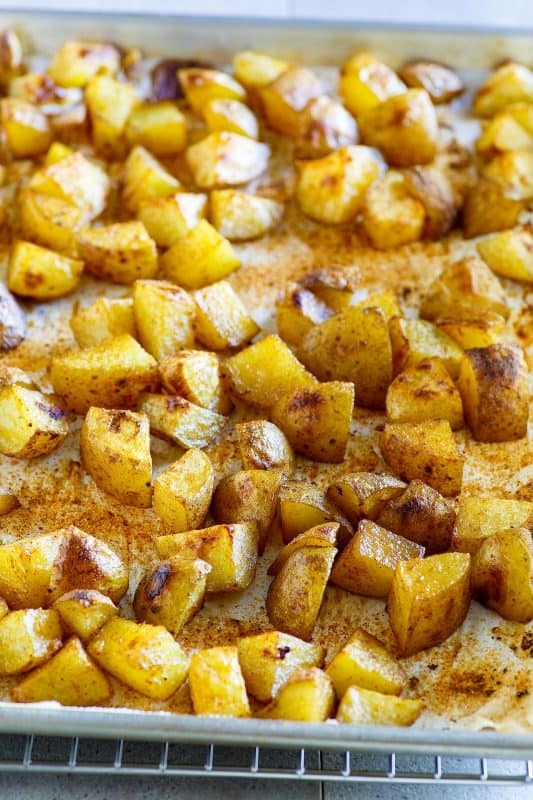 Now, that all said…why have I never tried making potatoes like this? It looks so simple yet so amazingly delicious, I must make them this weekend!! Thank you for sharing you! Beautiful message. My husband and I will celebrate 47 years of marriage this July. If I had it to do over, I’d marry him again and he says the same thing to his golfing buddies. We are truly blessed. I pray the next 47 will be even better than the first! May God continue to bless you and your family Carla and thank you so much for the encouragement! Please unsubscribe me., I love your recipes but cannot ever make a copy! I’m sorry you’re having problems printing. Every recipe on the site has a print this button on it and I make sure they are functioning properly on a regular basis, but there may be settings on your browser or computer that block these. If you want to unsubscribe there is a link at the bottom of every email I send. I hate to see you go but know you’re always welcome to join again at any time. I just have to say that my first thought after reading your post was, “Isn’t it just a sad world we live in that you have to brace yourself for negative comments, and front-load your post with ‘no offense intended’ disclaimers, only to share a story about a wonderful conversation with your very own children that a marriage with the right partner is a blessing from God?” I am so impressed, and so happy for you, that you have children who are almost grown and are looking to you for advice and inspiration. And that you can all sit down and LISTEN to each other! What an incredible thing, in this day and age, to have such a family! Thank you for sharing your conversation, your love for your family, and your faith. What an inspiration you are! It brought tears to my eyes, and I am so happy that you are guided by God’s love and not by the world. May God continue to bless you and your family! Thank you so much Joansy, that means the world to me and was something I needed to hear!! May God bless you and your family the way you have blessed me. I had a failed marriage early in 1994 after 7 years. We got married right out of college and hubby decided that he wanted to do things with his work friends and not with me. I spent a lot of time alone, in a new town. It was extremely difficult. He was not supportive at all, and now that I look back at it, he was a bit verbally abusive (mocking me for not losing weight, ignoring me in a store because my eyebrows were not plucked). Really crazy stuff. I found hubby #2 at work and we are almost to 20 years of marriage. It isn’t always flowers and sunshine, lost our business, filed for bankruptcy, but we stuck together. We laugh ALOT and poke fun at each other in a good natured way. It’s been a rollercoaster ride but I wouldn’t give him up for anything! The right one definitely makes a big difference, so glad you found your right one Ce!!! I do not like olive oil……will other oil work as well . .. ?.. Thanks! We love “those” potatoes here as well! We are at 43 years married and counting. Your right on target! Thank you Peggy, I pray God blesses you and yours as well!! Oh Christy…if I could shout AMEN any louder I sure would! What a blessing the Lord provided when He gave us the gift of marriage. And what a beautiful picture of His sacrificial love for His Church! My parents just celebrated 72 years last month, hubby and I will celebrate 52 years this year, and our kiddos and their spouses will celebrate 27 and 26! Now we are praying for special mates for the grandkids. God is so good!!! By the way, we live just over an hour from Disney World and there is no way you can get us there in the dog days of August. Mountains, here we come! WOW, what a wonderful legacy of love and commitment y’all have set forth for those young ones!!! God is good indeed!! Love your recipe – another similar one that we crave around here uses a package of dry onion soup mix and olive oil – yum! – we too love the various salts available now – found one in Utah last summer that adds so much flavor to everything that we are ordering more online!! Too far to drive from Texas! Thank you Virginia. If I may, what is the name of the salt you are ordering? I think it is terribly sad you have to worry aboit offending someone about the advice you give your children. You are spot on as far as I am concerned on nearly everything post. I know it takes courage to do that now and I am grateful you do. Thank you for putting yourself out there and speaking from your heart. Thank you so much for the encouragement Pam, it seems so many get offended so easily these days. You just never know. WE love potatoes like this and tonight we are doing it with sweet potatoes to go along with our T-bone steaks & asparagus that my hubs will be grilling. I love your posts and understand just what you’re saying. We will be celebrating 41 years in April and were 18 & 19 when we married. So blest that I have this man in my life and pray that our children will have this in their marriages also. What a wonderful meal!! I hope y’all have a wonderful Valentines Day together and get to celebrate another 41 together! Christy, great advice. Potatoes look great ! Thank you Mary, I appreciate the encouragement more than you can ever imagine!!! Congratulations on 48 years and I hope the next 48 are even better than the first!! Hi Christy, those potatoes sound divine, I will be trying them as soon as possible. I am very much of the same mind as you, I think a warm loving relationship that leads to marriage is something most good parents would want for their children. My eldest daughter is almost 40 and I continue to pray for her to have the chance to meet that special person, my other daughter is married but it looks like they are not going to have a family which saddens them and my young son is in the process of getting a divorce after his wife left him for another because he was not enough of a party animal for her, life is such a mixed bag but I remain hopeful that each one will get the chance to have a good mate for life, it is to be prized more then gold. Good advice on this Valentine’s Day. Hey, if you have a big ol honkin’ onion it will go pretty good chopped up in the Yukons.